The sloth is not lazy, just slow. Instead of foraging all day long to get enough energy from the leaves it eats, the sloth conserves energy by being inactive. This requires few heavy muscles, making the sloth light enough to climb high on thin branches where it can feed without worrying about jaguars. Still vulnerable to eagles, the sloth relies on camouflage for protection. Algae grow on its hair, giving the sloth a green tint that helps it blend in with the trees. Holding still, it is nearly invisible to predators. The sloth spends most of its time hanging upside down by its four-inch long, curved claws. It sleeps, eats, mates, and even gives birth in this position. While most mammals’ hair grows from its back to its belly, the sloth’s fur grows from its belly to its back so that rain runs right off of a hanging sloth. The sloth only climbs down to the ground once a week to go to the bathroom at the base of a tree, which perhaps fertilizes the tree, its food source. With back legs too weak to walk, the sloth must drag itself along the ground with its claws at a maximum speed of 5 feet a minute. In the trees, the sloth picks up speed, and can cross the canopy at 15 feet per minute in emergency situations. 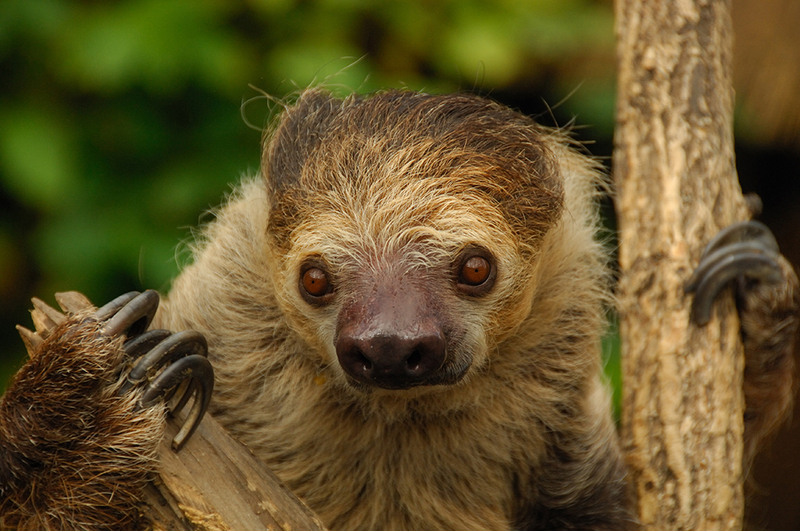 In addition to algae, the sloth’s fur is home to a variety of moths, ticks, beetles, and other small creatures. The Cincinnati Zoo is helping to save sloths through The Sloth Institute Costa Rica. Taking its Time:With such a slow metabolism, it can take up to a month for a sloth to digest a meal. True to sloths, Moe may be a slow, but she sure is a crowd favorite in the P&G Discovery Forest.